Posted March 25, 2016 by Heather Michet & filed under Food, Food As Medicine, Healing, Health Tips, Medicinal Plants, Recipes. Good ol’ Hippocrates had it right when he said: Let food be thy medicine and medicine be thy food. His words couldn’t be truer than when doing a cleanse and incorporating tonifying foods like dandelion into a smoothie. This powerhouse shake can help remove the body’s joint and cellular toxicity built up over the winter or after a time of over-indulging in heavy foods, drink, and too many processed foods. Additional bonuses may be loss of excess fats, weight and feeling sloggy. 1/2 green apple, cored & seeded. I like Granny Smith variety. Add all to high speed blender in manufacturer’s recommended order. Blend until smooth. 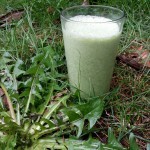 Enjoy and delight in the fresh and energizing feeling this mighty smoothie will give you.